Above: Ms Rocio Sanchez, 43, and her son Nicolas Cornejo, eight, take part in a candlelight procession around the compound. Above: A number of guests, like Ms Cristina Cortes, who is in her 40s, came dressed in traditional Mexican outfits. 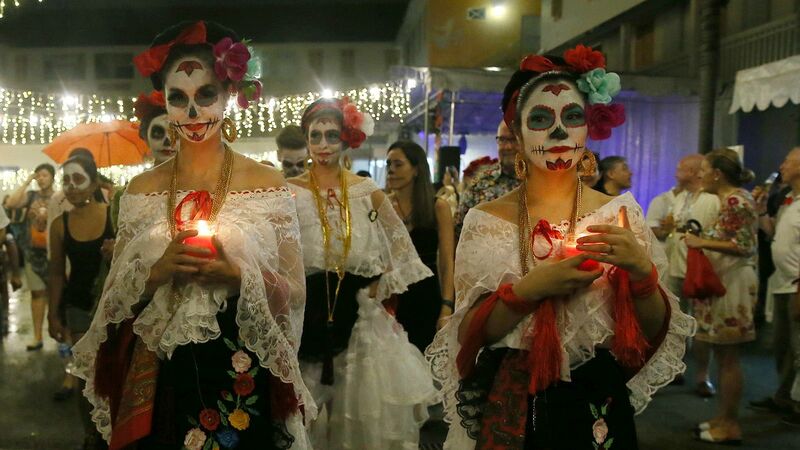 The light drizzle could not dampen the spirits of revellers who had turned up to celebrate the Mexican holiday, Dia De Muertos, or Day of The Dead, yesterday. People queued for culinary delights like tacos and quesadillas at the Old Beach Road Police Station, now a venue for events. In front of an outdoor stage, children and adults, some dressed in traditional Mexican costumes with painted faces resembling skulls, danced in the puddles to contemporary Latin American music. The scene reminded Mexican Ambassador to Singapore, Mr Nathan Wolf, of home. He told The Sunday Times: "You can't help but feel nostalgic. I'm about 17,000km from home but it's amazing to see a Mexican holiday being celebrated here and organised by Singaporeans." The event is run by independent creative, Angelina Lourdes, and co-organised with DMR Productions and done in collaboration with Embassy of Mexico in Singapore and The Mexican Association in Singapore. Despite its name, said Mr Wolf, Dia De Muertos is not macabre or intended to scare, and it has nothing to do with Halloween. It is marked by Mexicans on Nov 1 and 2 every year as a time to remember family, friends and ancestors who have died. Families traditionally set up altars in honour of the dead, said Mexican painter Bettsy Garcia Montijo, who has lived in Singapore for more than four years. Said Ms Montijo, 39: "We believe that the spirits of our loved ones will come back. By going to the cemetery to clean and decorate the graves of our loved ones, we establish a connection with them. "It means a lot to me that Singaporeans are helping us celebrate and observe our culture." There are around 500 Mexican expatriates in Singapore, but some 3,000 revellers had turned up for the event by the end of the evening. Amid the party atmosphere, the earthquake that struck Mexico and killed more than 200 people in September was not forgotten. A small booth set up by the Singapore Red Cross collected donations for earthquake victims. Performers dressed in traditional Mexican costumes and with painted faces carrying candles at yesterday's Day of the Dead celebrations held at the Old Beach Road Police Station. The procession stopped near "tombstones" to show visitors what normally happens at cemeteries in Mexico during the Dia de Muertos or Day of the Dead holiday. Families usually clean the graves of departed loved ones, and decorate them with flowers and place offerings to honour the dead. About 3,000 visitors attended the event despite showers in the evening. Correction note: An earlier version of the article said he event was put together by DMR Productions, in collaboration with the Embassy of Mexico in Singapore and The Mexican Association in Singapore. This is incorrect. The event is run by independent creative, Angelina Lourdes, and co-organised with DMR Productions and done in collaboration with Embassy of Mexico in Singapore and The Mexican Association in Singapore. We are sorry for the error.